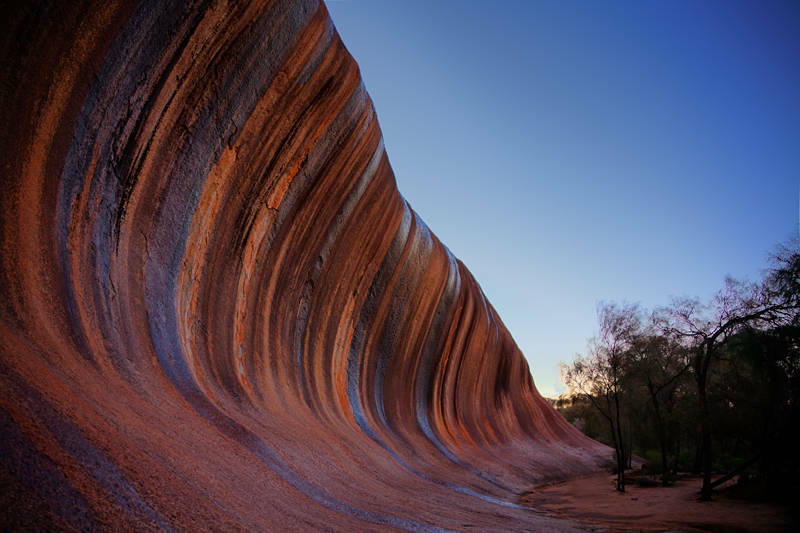 This is Wave Rock in Western Australia. It must be said Australia does rocks in a big way. This particular rock is made of granite and is more than 2.7 billion years old. The wave part of the rock is 14m high and 110 m long and has been created by a process of fluvial erosion. The stripes on the rock are caused by water which flows down from the top of the rock which slopes up from the wave at its base. This image was created by taking three exposures and combining them using HDR processing. The rock has attracted a number of eclectic tourist businesses over the years. There is an Animal Park where we saw the Koala, A Lace Museum, A Toy Soldier display, A Wild Flower Farm and a well provisioned if expensive Caravan Park where we spent the night. There are a number of walks and drives and I would recommend spending a couple of days there.